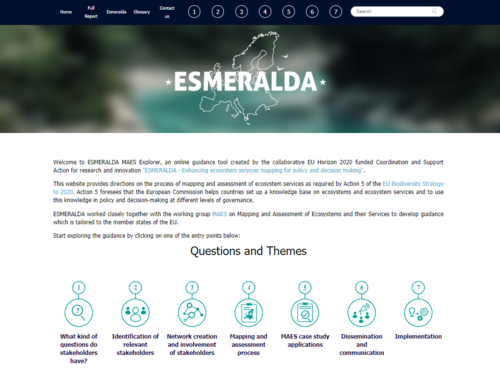 The recently introduced online resource – the ESMERALDA MAES Explorer – aids decision-makers from policy, science and society to implement Mapping and Assessment of Ecosystems and their Services (MAES) at different levels. MAES can reach from national policy to local spatial planning or businesses, who want to support sustainable resource use and understand the condition of ecosystems, their ability to provide services and the socio-cultural and economic values related to them. The online guidance tool is created by the collaborative EU Horizon 2020 funded Coordination and Support Action “ESMERALDA – Enhancing ecosystem services mapping for policy and decision making” to showcase major project results and to make them available Open Access, in support of Action 5 of the EU Biodiversity Strategy to 2020. Together with the EU MAES Working Group MAES, ESMERALDA developed the platform to share the project’s broad experience and to direct EU Member states, and other countries alike, through the process of mapping and assessment of ecosystems and their services. The MAES Explorer also links to the ESMERALDA MAES Methods Explorer – an interface that allows users to explore the comprehensive methods database created within ESMERALDA. The purpose of this database it to collect the majority of available methods to map and assess ecosystem services. Its aim is also to link those methods to specific ecosystem types, ecosystem services, questions from policy, business and society, tiers and practical case studies. “To ensure the perennity of the excellent project results available in the ESMERALDA MAES Explorer, we decided to cooperate with large information hubs and integrate crucial findings to external platforms, so they will be online after the actual project will have ended,” says project Coordinator Prof. Benjamin Burkhard, Leibniz Universität Hannover, Germany.